Regular readers know that I avoid negative comments about wines and wineries. I feel that there are already plenty of negative opinions out there, so I don’t need to add my voice to them. Characteristically, I focus on the wines I like and my positive wine experiences. Today however, I feel compelled to share a negative experience. 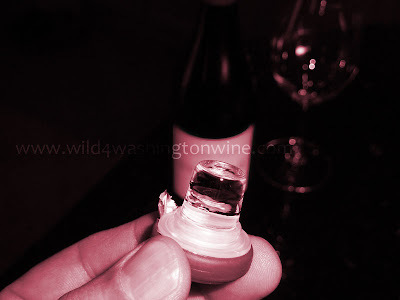 Four years ago I wrote about wine closure technologies (Seeking Closure). In the article I discuss the merits and failures of natural cork, synthetic cork, screw caps, boxed wine and the newer technology of glass cork (glass-on-glass stopper). At the time I had only seen a glass cork once, and felt unqualified to express an opinion. Well that’s changed; I definitely have an opinion on glass closures. The "glass-on-glass" stopper was introduced in 2004. Two brands I am aware of are, Vino Seal and Vino-Lok. Most of the online information on these technologies is from 2004 and 2006. Recently, upon a recommendation, I purchased a bottle of wine made by a favored Washington winery. I’ve personally visited with the winemaker of this bottle of wine, have enjoyed wines made by this winery over the last five years and recommend them as a “must try”. This particular bottle of wine was a red blend of two varietals 50% + 50%, it was a 2009 vintage (that’s as specific as I’ll get). This was my first time purchasing this particular blend and vintage. Perhaps you understand my eagerness to open this bottle. To say I was looking forward to enjoying this wine is an understatement. I had great expectations and preconceptions. To my surprise, I unexpectedly discovered that they sealed this bottle with a glass cork. There was no noticeable indicator on the bottle stating that it was sealed with a glass stopper. Natural cork is something I've grown fond of. I enjoy the ritual of opening a bottle of wine: 1. Remove the foil, 2. Insert the screw, 3. Turn, turn, turn, 4. Leverage out the cork - "pop", 5. Smell the cork, 6. Pour a little wine in the glass, 7. Swirl, swirl the wine, 8. Smell the wine and finally, 9. Taste and enjoy. Bottle in hand, excited to open this bottle; the knife on my waiter’s key quickly cut through the foil and released the closure easier than anticipated. As I stared into the open bottle, my first thought was, "oh, no, the cork is missing!" Then I felt the weight of the glass in my left hand and I realized I'd opened my first bottle of wine with a glass closure. A glass closure, a glass-on-glass stopper, yes, it really is a glass stopper – and as appealing as a glass stopper can be. My anticipation at opening this bottle was deflated by how easily the glass stopper slipped out. It was a let-down opening this bottle. Hey, I was expecting a real cork, not a glass stopper! So how was the wine? The wine was just ok. It did not "wow" as I had expected. I saved most of the bottle for the next day, hoping it just needed a little oxidation. Day two and the wine tasted no better, it seemed flavorful, but lifeless. Admittedly, my complaint with this wine may not lie with the glass cork, it could be the wine. But that perceived weak, and unexpected glass closure, set me up to find fault with the stopper. The closure ruined my wine experience. I believe that if this bottle had been sealed with a real cork, my perception of this wine would be better. It would have met expectations. My opinion is that, natural cork is still the best closure for wine. And natural cork is good for the environment (read the article). I'll take real cork next time, thank you. I welcome and encourage your comments on this article. This was my first real world experience with a glass stopper. If you feel the same about glass closures or have had positive experiences with glass stoppers, please leave a comment. You can also tweet me @wild4wawine. There, I feel better for sharing. On a positive note, I love my new little digital camera: Panasonic Lumix DMC-ZS7. Very portable, made in Japan and can take great photos.